Well, it’s a new year, and with that comes new year’s resolutions. Perhaps you made a resolution about going toxin free, or maybe you thought about it but then felt overwhelmed / discouraged / unsure / insert your emotion here because you’re not fully convinced about the answer to the question: Does going toxin free really matter? Obviously I think it matters, otherwise my blog wouldn’t exist. But there are always those that question – because we have no control over so many things we’re exposed to, what’s the point? And then there are those that say they would love to go toxin free but it costs too much. And I think it’s worth it. Because I firmly believe that every time we choose something toxin free, we are sending a message to whoever made that product that we stand by it. 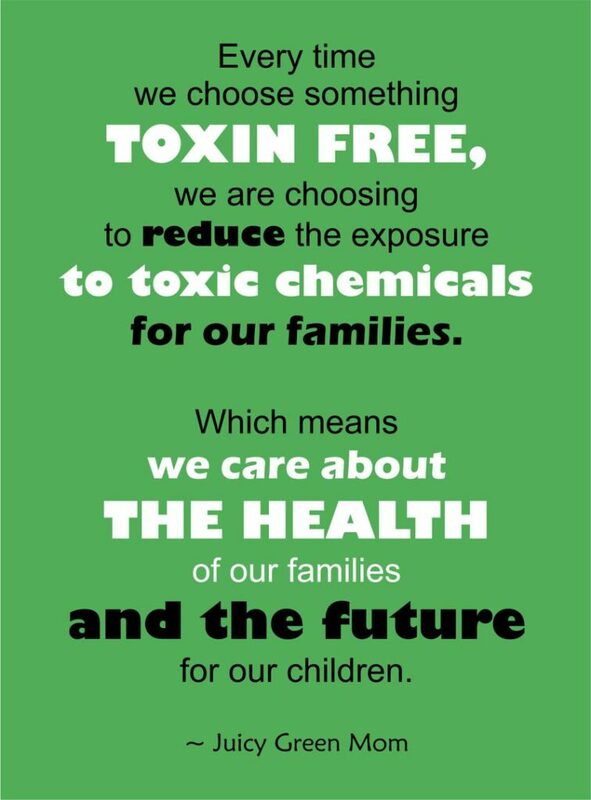 And with that choice, we are choosing to reduce the exposure to toxic chemicals for our family. Which means we care about the health of our families and the FUTURE for our children. And we care about the effect these products have on our environment. If you’ve read about me, you’ll know that I started on this green journey because of my sister’s diagnosis of breast cancer at the age of 31. And at that time, information was starting to come to the forefront about how things like endocrine disruptors could be playing a role in hormone-related cancers. When I was pregnant with my baby girl, it dawned on me that with a history of breast cancer on both sides of the family (my mother in law had it as well), I wanted to do everything possible to prevent a future of cancer for her. As a mother, I just want her to have a chance at a cancer-free life. So here I am. I don’t always make the best choices, and by no means is everything in our life toxin free. But I try my best. And ultimately, I don’t think I’ll ever regret trying my best, but I might regret not trying harder. So how about you? Are you trying to work your way towards a toxin free lifestyle? If you’re looking for frugal ways to go green, check out my Free Guide to Green Living on a Sensible Budget, and my Detox Your Home & DIY Guide eBook.